Chiswick Park Underground station eastbound platform will is to be closed from Wednesday 15 November until Tuesday 12 December. This follows the closure of the westbound platform earlier in the month. 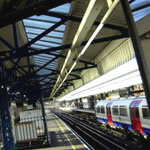 Bob Thorogood, District line General Manager, said: "During the platform closures, essential repair work will be carried out to the canopies which are of a unique design. Passengers should notice a much brighter, cleaner station when the work is done as well as improved safety and security features including state-of-the-art CCTV and passenger Help Points." Local commuters will remember similar pledges being made about Turnham Green station with little apparent change after months of disruption. There is bound to be scepticism that work will be finished on time given the experience with previous projects. The work at Chiswick Park is being undertaken by Metronet Rail SSL. Passengers travelling eastbound to Chiswick Park are advised to stay on the train and change at Turnham Green for an Ealing Broadway service. Before 05.23 on Monday to Saturday mornings and 06.41 on Sunday mornings, Passengers are advised to change at Turnham Green and use local buses which run all night. Passengers travelling eastbound from Chiswick Park are advised to take a westbound train to Acton Town and change for an eastbound service. During the closures, valid Underground tickets will be accepted on the alternative routes. Passengers should allow up to 15 minutes extra to complete their journeys. Other promised improvements include an enhanced PA system, better lighting and aids for the partially sited. Disabled access or lifts to the platform are not being provided meaning that there continues to be no tube station in Chiswick that is wheelchair accessible.